It is IPL time for cricket fans, and with the preparations for IPL 2019 at its peak and the opening match getting closer, the excitement is getting ever more feverish. This time the event is kicking off with a clash between two arch-rivals - the red and the yellow army. The Chennai Super Kings will be facing the Royal Challengers Bangalore this Saturday. It promises to be a match filled with loads of thrill, excitement and enthusiasm. CSK and RCB have faced each other a total of 22 times in IPL till date. Out of these it is the yellow army which has the upper hand; they have won 14 out of these 22 clashes, and RCB have won 7, with 1 match ending in no result. 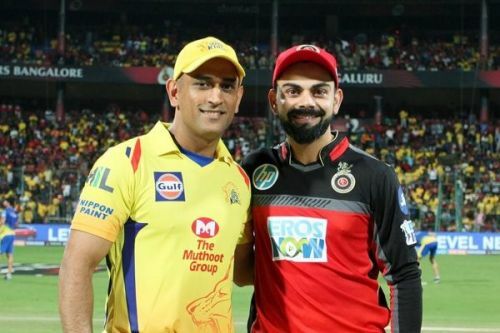 RCB last won against CSK way back in 2014, which will be a point to ponder upon for Virat Kohli and Co.
Matthew Hayden, Michael Hussey, Faf Du Plessis, AB de Villiers, Suresh Raina, MS Dhoni (c)(wk), Albie Morkel, Anil Kumble, Ravindra Jadeja, Ashish Nehra, Zaheer Khan. This is an XI just based on past stats though, and has no connection with the clash on Saturday. The sides have been completely changed since the time when Hayden and Hussey used to play. What has happened in the past is gone, and nothing can be done about it. But now there is a new and a fresh season awaiting both teams, and RCB would try to defy all odds and be eager to increase their count of 7 wins to 8 against CSK. CSK on their part would be proud of their record against RCB but would definitely not take Kohli's men for granted.